Despite many students going on vacation in between terms, for a team of University of Waterloo Humans vs. Zombies players the weekend of April 22 was the opposite of relaxing – they tried to prevent zombies from taking over the world! Humans vs. Zombies (HvZ) is a game of manhunt simulating a zombie apocalypse. Zombies attempt to tag humans to turn them into zombies, while humans defend themselves by shooting zombies with Nerf blasters and hitting them with socks. 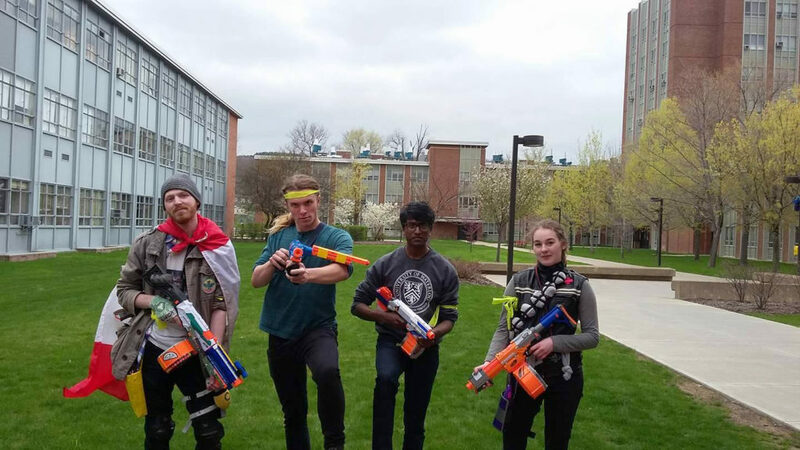 HvZ can be found at many American universities, and although the game thrives at UW it has yet to percolate through the rest of Canada to the same extent. The event took place at Binghamton University in upstate New York, and approximately eighty people participated in an intense game lasting from 10 a.m. to 6 p.m. Binghamton’s Zombie Students Association hosted the occasion, themed after a typical competitive cooking show. Overseen and judged by impersonators of Alton Brown and Gordon Ramsay, human players had to accomplish missions where they assembled “meals” while zombies attempted to tag them. Besides the UW squad, participants came from schools all over New York, such as Rochester Institute of Technology, SUNY New Paltz, Clarkson University, Ithaca College, Le Moyne College, and event alumni continue attending HvZ games after graduation. At UW, there is a week-long game of Humans vs. Zombies once per term, as well as smaller weekend events and an open game at the end of every summer. For more information, check out the uWaterloo Humans vs. Zombies facebook page or uwhumansvszombies@gmail.com. From left to right: Ben Paul, Keri Warr, Jordan Verasamy, Sarah Roberts, students from UW who competed at Binghamton University.